That's Reince Priebus from Kansas City discussing the 2016 Republican presidential nomination process before the Midwest Republican Leadership Conference. Priebus defended plans to shorten the primary season by imposing "a death penalty" for any state that jumps ahead of the national party's calendar, cutting their delegates to the national convention to "next to zero." He proposed to hold no more than eight GOP primary debates, with the party picking the host partners and moderators. Candidates who participate in unsanctioned debates should be penalized 30 percent of their delegates, Priebus said. Now, FHQ will try not go too deep on this. After all, this just an idea that is floating around out there.1 The "death/super penalty" is on the books, but earlier conventions and presidential primary debates sanctions among other things are not. These are all matters that will be discussed, tweaked or completely changed by the RNC's new Rules subcommittee. On some level, this is a long way for me to say, "Hey. Look at that 'should' in 'should be penalized' in Priebus' comment about primary debates." Despite the presence of some uncertainty as to the final version of the RNC rules for 2016, the 30% figure does continue to leave us with some questions about any proposed penalties and how they are meted out. And truth be told, those questions are the same basic questions FHQ posed several weeks ago during and in the aftermath of the RNC summer meeting in Boston. But now we have something concrete from the chairman of the national party in the way of sanctions. First of all, this statement makes clear that the RNC is considering a plan similar to the DNC rules that attempt to rein in rogue states on the primary calendar. 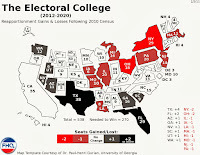 The DNC instituted a plan for the 2008 cycle that would not only hit those states in violation of the rules, but also penalize candidates who campaigned in those states. Given Chairman Priebus' comments, the RNC may look to go in a similar direction though seemingly directed more at the candidates than the states/state parties. The new question that emerges is, "30% of which delegates?" Is this 30% of the overall delegates a candidate has/will have? Is it 30% of the delegates won from a state that holds a rogue debate? Why are states/state parties not penalized for holding unsanctioned debates? The first two subquestions are direct alternatives to each other. Either the RNC under this plan would penalize 30% of all of a candidate's delegates from all states or just rogue debates states. The latter seems more "fair" but if the objective is keep the candidates away from presidential primary debates that are conducted minus the national party's blessing, then that former may prove more effective. If you are Newt Gingrich, for example, then losing about 8 of 23 delegates after having participated in a hypothetically rogue South Carolina debate is probably better than losing 41 delegates from your eventual 135 delegate total.2 Candidates, depending on the race and their relative positioning among each other can probably shrug off the loss at the state level, but would find it much more difficult to do the same if the penalty affected the overall total. Extending this, what would happen in the case of multiple violations?3 If the penalty is assessed on the state total and not the overall delegate total, the multiple violations problem is somewhat minimized but not completely eliminated. Under that rule/sanction, candidates would be penalized for participating in hypothetical rogue debates in Iowa and New Hampshire, for example. They would lose 30% of their delegates in each state. Under the alternative "penalize the overall total" there is nothing left for the party to use once the penalty is handed down. A candidate could rationalize continued participation in rogue debates by saying either, "I've already been penalized, what's to stop me from taking part in this next unsanctioned debate?" or "There's no way the RNC is actually going to stick to this penalty. I'll go ahead and attend this next debate." Of course, the same sort of rationale exists for the candidates under the state-level sanction as well if there are multiple rogue debates in one state. They can't be penalized twice. All of this makes the final subquestion above all the more interesting. Why not penalize the states/state parties as well? To some extent, the penalize the candidates strategy is sound, albeit with some backwards logic. By penalizing the candidates, the candidates are bound to stay away from rogue debates and thus state parties will not hold them. That could happen, but if you are the RNC, why leave it to chance? Even if the frontrunner is an establishment-type candidate, it will be hard for such a candidate to stay away from all of these debates should others participate. I keep thinking of the 1980 general election presidential debates, particularly that Reagan/Anderson debate. They took aim at Carter instead of each other for nearly the entire time. Carter had no equivalent way to respond. If states/state parties are not checked in some way, what is to prevent them from allowing a similar forum for any and all also-rans through viable alternative candidates from participating and raking the aforementioned frontrunner through the coals for an hour to an hour and a half. Actually, those candidates would have incentive to do so -- attack -- in order to negate the deficit created by the 30% delegate penalty. The objective is to reduce the number of delegates for a frontrunner by making that candidate less palatable to voters. And again, without a debate stage, it is most difficult for a non-participating candidate to respond in kind. How does a national party disincentivize this outcome without penalizing the states/state parties as well. Overall, this is a tough calculus for the campaigns to undertake. It isn't as if what we're talking about here are real delegates allocated after a given state votes. 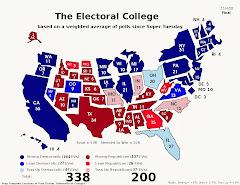 Rather, the issue to attempting to ascertain the impact of all of these movements on a virtual delegate count in the months leading up to the Iowa caucuses. Backfire. The rules change instituting a candidate penalty backfires. 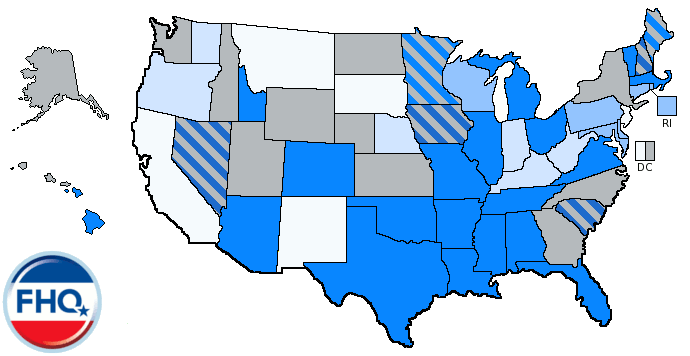 Either an establishment-type candidate is frontrunner and is baited into participating in rogue debates as a defense mechanism or a candidate other than an establishment-type is the frontrunner, is able to stay away from any rogue debates, and begins primary season against a group of candidates who, on the offensive, were forced to participate in unsanctioned debates and are at a delegate deficit before any delegates are actually allocated. A redefined invisible primary. Let's call this one the "Only winning move is not to play" strategy. No, I'm not talking about not playing in any rogue debates; I'm talking about not playing at all. If the calculus of all of this is so rigorous, why not skip it? Delay jumping into the race as much as possible. If you are a frontrunner (or potential frontrunner), establishment-type candidate and incentives exist in the altered rules for your adversaries to attack and attack and attack you in rogue and sanctioned debates, why not remove the target? Don't run or delay running until the last minute. [Think of the possibility for white knight stories!!!] This option seems like a magic bullet for the RNC, but one that looks good in theory, but not necessarily in practice. Yes, there may be an emergent and perverse pressure among the viable candidates to hold out as long as possible, but 1) It is hard to invisibly/unnoticed put in place the infrastructure necessary to run for a presidential nomination; 2) Given that reality, states/state parties may still have incentive to host rogue debates; and 3) Additionally, the press involved in those hypothetical debates would be potentially likely to ask participants about the policy positions of looming candidacies whether they have an presidential nomination exploratory committee or not. Some form of backfire seems most likely. However, the bottom line here is that tinkering with rules in this particular area borders on being a fool's errand. It crossed the line from managing the presidential nomination process to attempting to control it. National parties that have crossed that line in the post-reform era have been the parties that have faced unintended consequences -- often bad ones -- when the rules go from paper to practice. 1 Granted, the idea is one that is coming from someone -- the RNC chairman -- with some power over the process, but still, it's just an idea; not a rule. 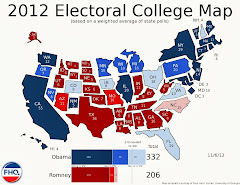 2 This exercise utilizes Gingrich's delegate figures from 2012 in South Carolina and overall. 3 Recall, that the multiple violations problem was an issue for the RNC in 2012. There was no contingency in place for states that violated both the timing rules and the proportionality requirement. There was only one 50% penalty that could be levied whether one or both rules were broken by states. Florida, for instance, did not face two 50% penalties for holding a non-compliant January primary and allocating its delegates in a winner-take-all fashion. I don't see how this is remotely feasible. A 30% penalty against the *national* delegate total that the candidate wins? I can't imagine that that would ever be enforced in a scenario where the penalty would have a determinative impact on who the nominee is. Can you imagine, for example, a 2008 Clinton vs. Obama style fight to the finish on the GOP side in 2016, a tight race between two candidates for the nomination? But the candidate who comes out on top in terms of votes and delegates ends up losing 30% of his delegates and losing the nomination, because he participated in an unsanctioned debate 9 months ago? How would the party leadership ever explain that one to the voters? OK, so how about sanctioning delegates in individual states where the debates took place? OK…..except, who really cares if your delegate total in New Hampshire is reduced by 30%? The state has very few delegates to begin with, and the election night story is about who won the most votes there, not the most delegates. If the sanction is counted against the state delegation that hosts the debate, what do you do about debates that don't involve state parties? Last time, we had some debates sponsored by entities like "Tea Party Express", not affiliated with any state party. How is the GOP state party in Michigan, for example, supposed to prevent some outside group like Tea Party Express from holding a debate in the state and inviting the presidential candidates? Or what about if groups like that decide to host "rogue" debates in places like Washington, DC. DC has no Republican party to speak of, and virtually no delegates. None of the candidates were ever going to bother campaigning within the district anyway, so what difference does it make if the district's delegates are sanctioned? As I said, this is just an idea at this point. One that I don't think is necessarily fully baked. It is a potential move rife with unintended consequences.